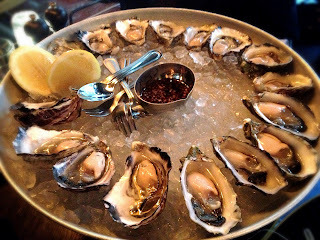 Oysters - people either love them or they loathe them. I love them! So when I discovered that a new oyster bar has arrived in town, I knew I had to drop in quickly. The Morrison Bar and Oyster Room is situated in the old Brooklyn Hotel on the corner of George Street and Grosvenor Street, Sydney. It was an old post-work favourite forced to close its doors in recent times due to the competitive boom of glitzy and glamorous bars, and the Sydney small bar revolution. The venue has been vamped up but much of the heritage and industrial-looking features have been kept, if not enhanced. The place is furnished with old-school brick walls, white tiles, vintage edison light bulbs, lots of wood and green leafy shrubs. Even their staff is dressed to impressed with their black & white checkered bow ties and vintage country textile aprons. Classy, stylish and absolutely charming! The menu is presented on a clipboard and the food is not anything less impressive than their fancy décor. Up on a wooden board hangs the daily pick of oysters. Today's specials were Clyde River NSW, Nambucca River NSW, Coffin Bay SA and Bruny Island TAS. We ordered one of each per person, plus a few tequila oyster shooters (how could I resist!). Our sangrita, tomato, pomegranate, kaital and lemon Oyster Shooters arrived first. 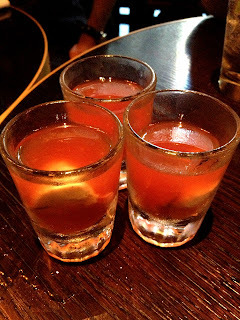 I have never tried oyster shooters with tequila before as I would usually opt for a bloody mary if available. I found the tequila burn a little too strong for the oysters and the rim not salted enough. The Shucked Oysters then followed - chilled and very fresh with a vinaigrette dressing. I was impressed that even the oyster forks were pre-chilled which makes eating the oysters even more enjoyable. We started with the pacific Clyde River, which we found very fresh and briny. Next was the rock Nambucca River, which was very rich and creamy (this was my favourite of the lot). The pacific Coffin Bay is a lot more commonly seen around, and we found it clean, lightly salty and metallic. Finally the Bruny Island TAS, which we found most salty comparatively and had a firmer body. 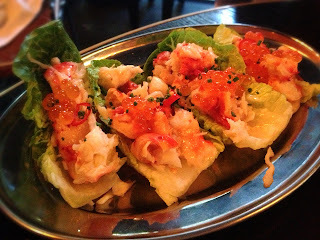 Next came the Crab & Lettuce Tacos. These crispy baby cos lettuces were topped with shredded crab meat, salmon caviar and a chardonnay vinaigrette - something different and delicious! We were quite surprised that scampi was offered on the menu and had to try it. If you have not tried these before, they look like a toy-sized lobster (or a prawn with claws), and are usually found served raw as sushi or sashimi, or served cooked with pasta. 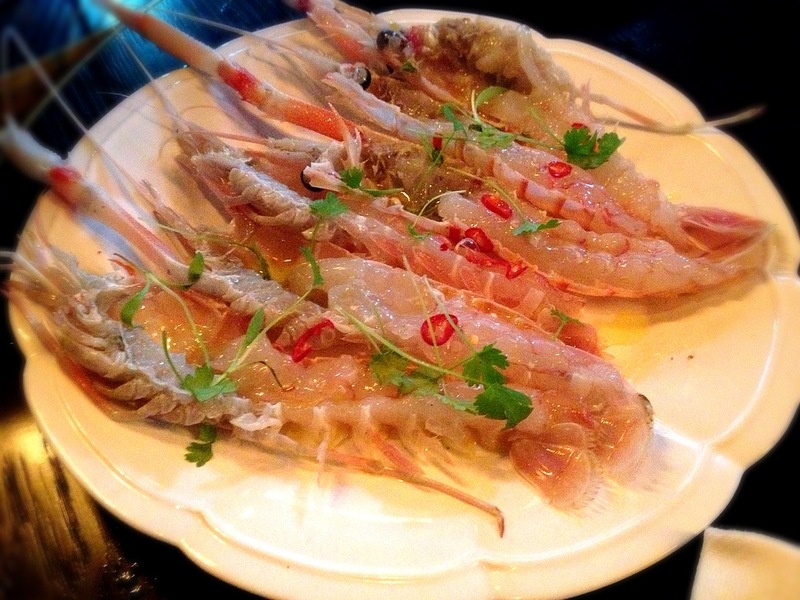 The Split Scampi Sashimi Style we ordered was presented raw, chilled and very fresh, dressed with chilli, olive oil and sea salt. Perhaps I am accustomed to eating my scampi with soy sauce, I found the taste a little lighter than how I would like it? 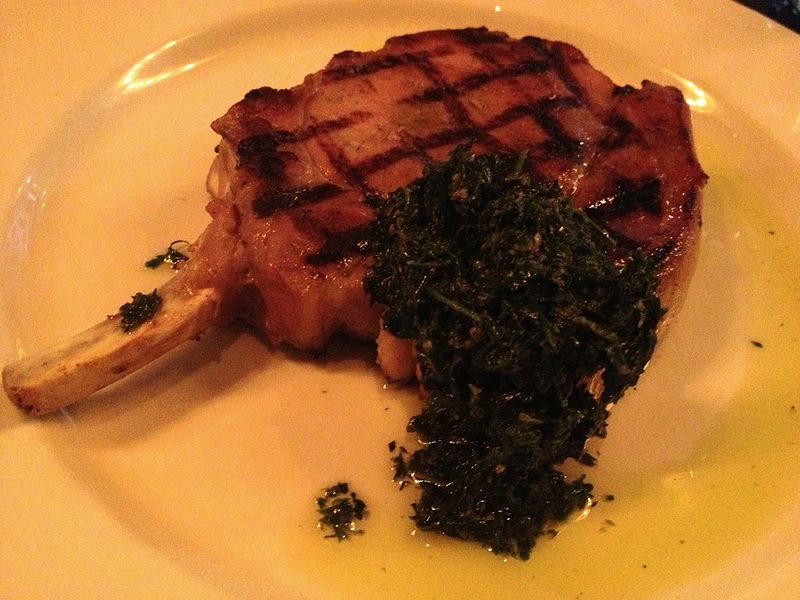 Executive Chef Sean Connolly says "Everything tastes better on the bone or in the shell", and I could not agree more. 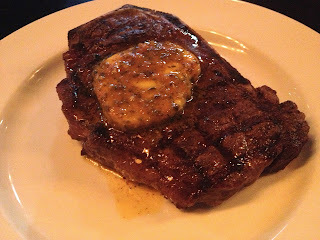 The Grain Fed Sirloin On The Bone served with anchovy butter was the best piece of steak I have eaten out for a while! 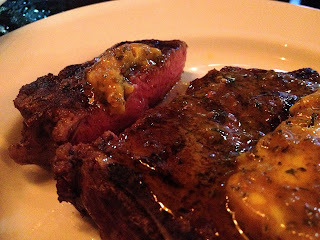 The meat was cooked perfectly over charcoal, was tender, juicy and had a smokey charred flavour. The Grain Fed Pork Chop was also a winner. Again it was served on the bone and cooked over charcoal, the meat was very tender and juicy. 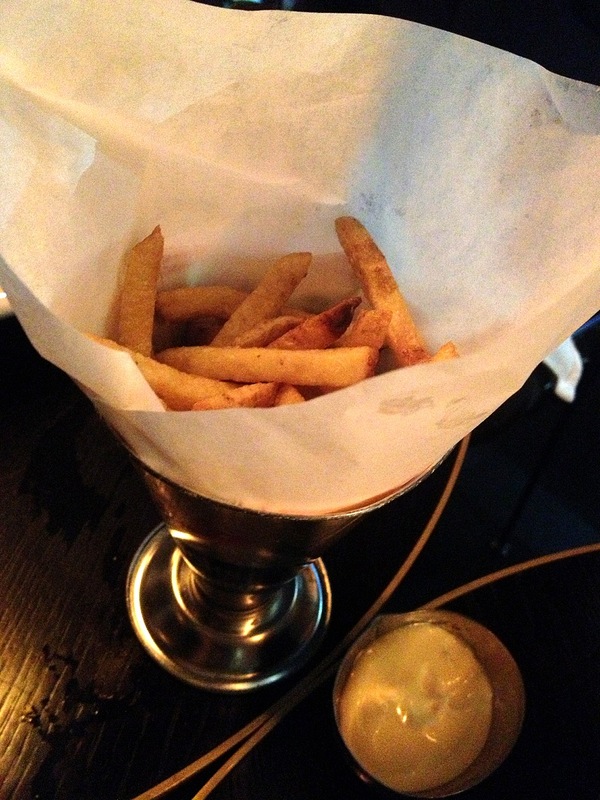 We ordered some Duck Fat Chips to accompany the grilled meat. Yes, duck fat. What better way to boost up the flavour (and calorie count) of chips! Yummo! 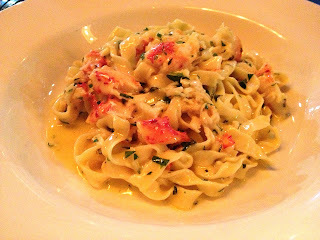 Finally we ordered the Snow Crab Linguine with parsley, mint, chilli and lemon. It was full of flavour and slightly, but not too creamy. It was the perfect finish to our tongue-tantalising meal! The experience was very pleasant, the food amazing, and the ambience casual and lighthearted. The Morrison Bar and Oyster room is a crustacean and charcoal-grilled meat culinary wonderland that is perfect for after-work festivities and catching up with large groups!